Supporting local handmade business owners is the best gift you can give. Share their social posts, invite people to their events and buy their art. However, if you're looking for something more tangible to give them, items they want, but might not buy themselves, I've compiled a handful of fun ideas to consider. Some of these goodies are useful and others are more playful. All were selected with a creative personality in mind! If I missed any must have gifts, let me know! 1. Gift Certificates – Extra money to buy supplies and services that make their work possible. 2. 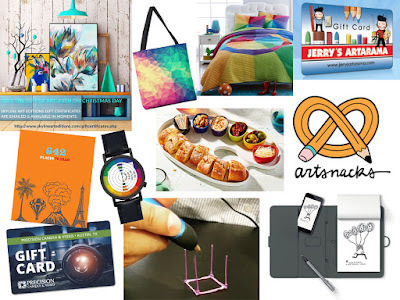 Art Snacks Subscription – Monthly box of interesting art supplies to keep creative juices flowing. 3. The 3D Printing Pen – Bring out the kid in your favorite artist with new technology! 4. Scribble Pen – Draw with any color ink thanks to a high tech scanner that reads and recreates. 5. Smart Notepad & Pen – Wacom Bamboo Spark to draw on paper that creates a digital copy. 6. Paint Brush Stylus – Turn paintings into digital works with the stroke of a brush. 7. Fancy New Easel – So many styles to choose from for any media, painting, drawing, etc. 8. ColorMunki – Device to calibrate your computer monitor for more predictable color. 9. Pantone Gifts – Colorful items, both fun and functional for hue experts. 10. Art Business Books – Professional development to help with the business side of being an artist. 11. Color Wheel Items – Because color is the basis of all art! 12. Artist Palette Serving Dish – Because entertaining is also an art! 13. Portable Printer – Make it easy to produce photo printouts for collateral and more! 15. Trip to a very sketch, paint or photography worthy city – So they can fill out this sketchbook! This barely scratches the surface, so I'll keep adding ideas on Pinterest. Enjoy!